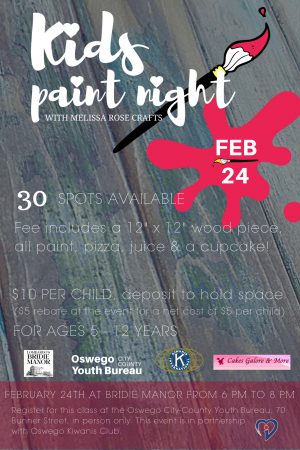 OSWEGO – The Oswego City-County Youth Bureau and the Oswego Kiwanis Club will sponsor a kids’ Paint and Pizza Night at 6 p.m. Feb. 24, at Bridie Manor, 1830 Bridie Square, Oswego. The $10 registration fee includes paint, wood, pizza, drinks and a cupcake donated by Cakes Galore. The host of the event is Melissa Rose Crafts. Registration must be paid in advance at the Oswego City-County Youth Bureau, 70 Bunner St., Oswego, NY 13126. Office hours are Monday through Friday, 8 a.m. to 4 p.m. The office will be closed Monday, Feb. 20, for Presidents’ Day. The Paint and Pizza Night is open to children ages four to 12. The first 30 children to register will receive a $5 refund at the event. To register, visit the Oswego City-County Youth Bureau.